It was our middle son's 6th birthday party this weekend, and we chose the easiest option - get someone else to do it! Well, that's not strictly true as they had one hour of football and sports at the local leisure centre (organised by the leisure centre staff), followed by a tea party (organised by me, my Mum and Mother-in-Law). As always on these occasions, I ignore my own well-researched advice and leave everything to the last minute - inluding the personalised party boxes which were hot off the printer with approximately 30 minutes to go, and filled at the last minute. I found this quite easy, because the boxes snap together in about 1 second, and are very rigid so it's easy to chuck a few fillers in there. 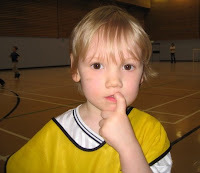 Having lost the list of invitees, it was impossible to check that everybody had replied, and seeing as we are quite new to the area, quite embarrassing to approach random mothers in the playground to see if their child a) had been invited and b) were coming! In the end we had a very good turn out and everybody seemed to really enjoy themselves. 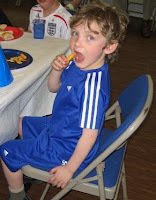 All the kids were really well behaved too, and ate most of the food, so a big success in my book. 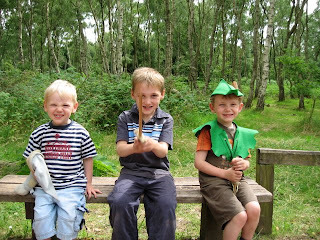 Here's some pictures of my boys (from left to right - Matthew 8, Adam 6, Oliver 3) who really did us proud on the day. Spring is (just about) in the air, so we are launching our Spring competition. The prize this year is an Eco friendly 100% cotton party bag, jam packed full of party bag fillers from Funky Dory Party Bags, worth £20.00. All you have to do is find the Funky Dory Frog, which is hidden somewhere on the website. Competition ends Midnight, 11th May and is free to UK residents aged 18 or over. Only one entry per household. We recently introduced character party bags onto the site, and so far they are selling really well. The most popular characters are Charlie & Lola, Disney Princesses, and for boys, Spiderman. We have a range of filled character party bags, or you may choose one of our other party bag filler combinations and select your favourite character. So far we have party bags in the following characters: Disney Princesses, Charlie & Lola, Spiderman, Batman, Barbie Fairytopia, Lazytown, Roary the Racing Car, In The Night Garden, Dora The Explorer and Disney/Pixar Cars. New characters will be added over the few months, so keep your eye out for your favourite! Until now, the best selling product at Funky Dory Party Bags has been our personalised party box, specifically the Fairy Princess design. In total there are 5 designs to chose from - Fairy Princess, Monkey, Pirate, Dinosaur and Cow. All the images are taken from original paintings by talented children's artist, Helen Broadhead, and are unique to Funky Dory Party Bags. We can customise your box with the message of your choice - popular messages being a child's name, or a simple "thank you for coming to my party". They are also very popular as activity boxes for weddings, and at only 85p each, they are outstanding value. Although these boxes are extremely popular, it's no surprise to me that they have been overtaken by another unique product - the filled animal mug. This is a plastic animal mug in 4 designs (crocodile, monkey, elephant, giraffe), filled with a balloon, square of stickers a toy (optional), and wrapped in a cellophane party bag. 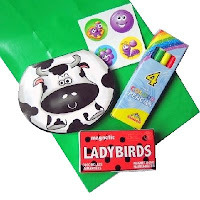 I believe the reason for their popularity is the fact they provide an unusual alternative to a party bag, and are equally suitable for boys and girls. 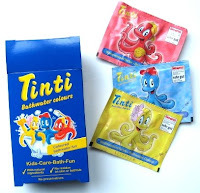 New for April at Funky Dory Party Bags are the Tinti bathwater colours. Dermatologically tested, these tablets are made with natural ingredients, with no preservatives and leave no residue on the bath or skin. They are fantastic fun for children aged 3 and over and can be used in the bath, paddling pool, or even a bowl of water. Simply drop the tablet into the bathwater. It then bubbles and turns the water either red, blue or yellow. You can buy them as a single tablet, in a pack of 9, or in filled party bags for boys and girls. That, as they say, is a very good question! Quite simply, this blog is about me, my family, and my business. It's a place to feature new products, and to share news of the websites. 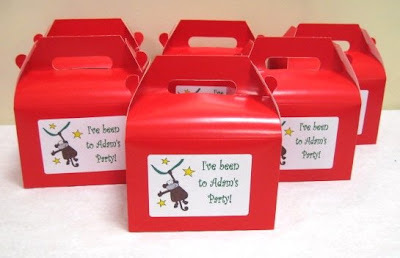 I've been selling filled party bags and personalised party boxes online since September 2005. It began as a hobby which I did to exercise the brain cells whilst I took a career break to raise my young family. The plan was always to re-enter the world of gainful employment when the boys all started school. After a year or so, however, it became apparent that people actually liked the products I was offering, and sales were increasing significantly month on month. So I decided to make a go at my own business. This decision wasn't a difficult one. I'd been out of the workplace for a considerable time ( 6 years to be exact), and I was beginning to find the prospect of returning to work not only daunting, but actually quite hard to achieve. So, fast-forward a year or so and the decision and hard work that, it had to be said, went into building the business is finally showing some reward. 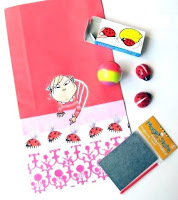 Funky Dory Party Bags has a prominent Search Engine presence and a fast-growing reputation for affordable, quality products, coupled with attentive customer service and fast delivery. What more could you ask for?